Tenor saxophonist Sonny Rollins has gone from appearing on the very first LPs in the early 1950s through to the CD era and now into the digital age. Along the way, Rollins has played with basically every important figure in jazz including Miles Davis, Thelonious Monk, John Coltrane, Max Roach and Clifford Brown to name just a few. With a knack for re-inventing himself every decade or so, Rollins would become a reigning champion on the tenor sax, then temporarily retire as trends in jazz would change. He would then re-emerge with a new approach that would not only fit with the current style, but would remain true to his own distinctive sound — once again re-establishing his pre-eminence on his instrument. In the 1950s, Rollins was the quintessential hard-bop master, recording such classic LPs as “Saxophone Colossus,” “Way Out West” and “Newk’s Time” before dropping out to reassess where jazz was going. Several years later he would re-emerge with his all time classic “The Bridge” — beginning a period of accommodation to the emerging avant-garde sounds of Ornette Coleman and John Coltrane. Later in the 1960s, Rollins would “retire” again only to emerge in the early ‘70s with a more R&B/pop feel to his music. This phase of his career would last for an unprecedented thirty-five years and result in scores of albums for the Milestone label, exploring all types of jazz from tropical, to ballads, to entire albums of just solo tenor sax. Now in his eighties, when anyone would legitimately and justifiably retire, Sonny Rollins has released an album that would fit right in with any Rollins period, while managing to stylistically span his entire career. 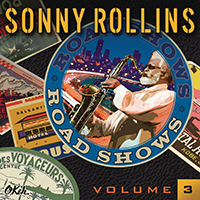 “Road Shows Volume 3” (Okeh 8843-04998-2) continues Rollins’ series of performances from some of his more recent concerts from around the world. Starting off with “Biji,” Rollins himself is in fine form throughout — having the precision, drive and energy of someone half his age. His sound, his approach and the flights of fancy that make up his extensive solos on this recording have not diminished a bit over the years. In fact, if one were to compare the solos here with those recorded 30 to 40 years ago without knowing which was new or old, it would be impossible to detect any difference. Anyone who doubts this should check out “Solo Sonny.” A literally eight-minute saxophone solo that neither drags, nor grow tedious, filled with numerous musical asides and quotes from forgotten tunes as well as standards — all effortlessly and seamlessly interwoven throughout. Equal to the task of keeping up with him, the supporting musicians all turn in fine performances and solos, notably Clifton Anderson on trombone, Bobby Broom on guitar and Bob Cranshaw on bass. Closing out the set is the tune that has come to be the tenor saxophonist’s signature: “Don’t Stop the Carnival.” Originally recorded by Rollins over 50 years ago, it has become as closely associated with Sonny as “Take the A-Train” is with Duke Ellington. As such, it has made several appearances on Rollins’ recordings over the years, but with it’s buoyant Caribbean flavor, always serves as the perfect finale, bringing the audience to its feet and dancing up the aisles. Now aged 84, Sonny Rollins shows no signs of slowing down. Whether you hear this album as a regular CD or download it directly to I-Pod, you’ll want to see him the next time he hits the road.